My husband and I took a trip to Belize and spent some time in the jungle. On our first day there, our tour guide grabbed a thin stick and asked us if we wanted to see what came out of this hole in the ground. I knew it had to be either a snake or a spider, and I was only about three feet away! I watched as he twisted the stick around in the hole, and after a few seconds, out came a tarantula that was about six inches long! Surprisingly, I didn’t even jump. The spider had no interest in me – he was just playing with the stick our tour guide was moving about. I was entranced by him, and because I expected that he might appear, I didn’t feel afraid due to the element of surprise. My husband looked at me and said, “You’re not freaking out!” And my response? “He’s actually kind of beautiful!” I NEVER thought I would use that word to describe a spider. After a minute or two, the tarantula went back into his hole and we all moved on. A couple of days later, another tour guide grabbed a stick and brought us to a hole in the ground. “Ooh, are we going to see a tarantula?” I excitedly exclaimed. My husband looked at me and said, “Who are you and what did you do with my wife? 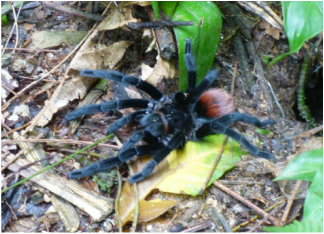 You actually WANT to see another tarantula?” I did, and we saw two more! 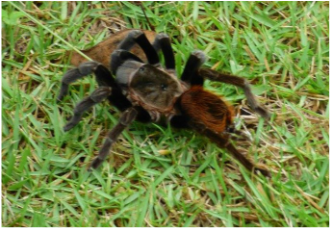 These are REAL images we took of our tarantula experience (not fabricated or taken by anyone else)! The most amazing “ah-ha!” moment came for me later that week, when a pretty large spider (not a tarantula, but large by New York standards) found its way around the hot tub on our Belizean treehouse porch – right next to where we were preparing to take a bath! While I initially jumped in surprise, since I didn’t expect to see him there, I didn’t freak out like I would have done previously! I didn’t even feel the need to squash him! I just gently guided him out of the way with my flip flop and went about my business – I even continued to take the bath! I was SO proud of myself! I feel like I have come a LONG way in my fear of spiders. So why did I tell you this story? Because although I had been “afraid” of spiders my whole life, I was able to have a few experiences without pressure, where I wasn’t having to react to the spider coming out of nowhere, and I was able to learn about spiders in a situation that actually brought me great joy (i.e. being in Belize). Since then, I no longer freak out when I see a spider crawling on my wall or I walk into a spider web when on a hike. I no longer hesitate about going into my parents’ old unfinished basement for fear I might find a spider on something that’s been buried away in storage for a while. I learned to handle my fear reaction in a productive way!